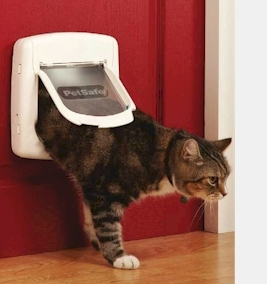 The Staywell Deluxe Magnetic Cat Flap helps keep out stray cats - your cat wears a magnetic collar key which 'unlocks' the cat flap allowing him to get in. No batteries required and suitable for most installation materials. Use tunnel extensions to fit any depth of wall. Available in white or woodgrain finish and is suitable for cats up to 7kg.